UPDATE: It appears the issues described in this post have been resolved. Enjoy iOS 10! iOS 10 was just released and a lot of people jumped on it immediately. As a consultant I do as well so that if there are issues I can notify my clients. The update downloaded quick and took about 5 minutes to install. Then the phone restarted and the feared “Connect to iTunes” screen popped up. This turns out to be a widespread problem as online forums and Twitter are blowing up with similar experiences. Before you connect your iOS device to iTunes, make sure you have the latest version which was just released. 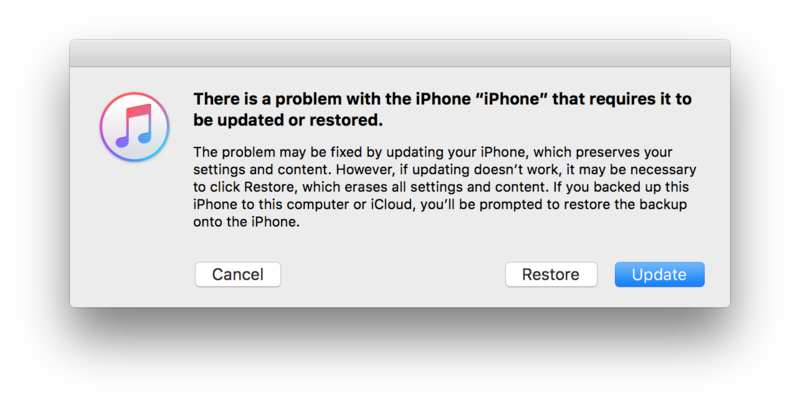 Without this version, iTunes will put your device back on 9.3.5. The new version will offer 10.0.1. If you do want to chance it and update your phone, make sure your data is safe then (after updating iTunes) let iTunes update the phone for you. iTunes appears to offer the right version right away whereas the iPhone over the air mechanism offers 10.0.0. I thought it was weird to see both a 10 and 10.0.1 update mentioned on Apple’s Security Updates page. Now we know why 10.0.1 is there. Why Apple still has 10.0 available on it’s servers is a mystery. Be sure your update mentions 10.0.1. Even though the update may have failed on your device, it is not “bricked”. Even though that’s a very popular word used in the media as this story unfolds. After iTunes restores and updates your device, you will be back in business. Previous Previous post: Adobe Flash Player – Damned if you do, damned if you don’t? Next Next post: Covering your webcam, a good idea.